After a drab first half lashed by torrential downpour affecting the performance of both, second half both teams came out attacking to extract a result from the game. India looked better side going forward as Sunil Chhetri, Udanta and Jeje showed their attacking prowess while Kenya had a couple of opportunities on the break. 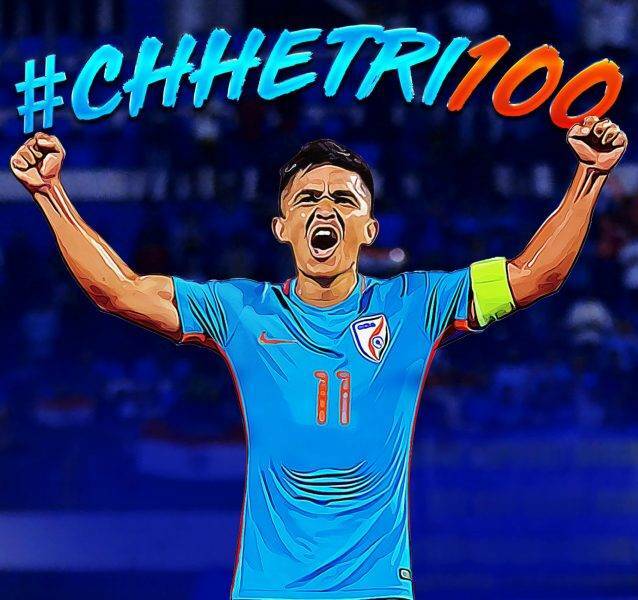 The deadlock was finally broken when Sunil Chhetri playing his 100th International match for India was brought down marginally inside the box and the referee awarded a penalty to the home side. The Mumbai Arena was buzzing with raucous home support to witness the man of the moment step up and slot home a penalty to give India the lead fittingly in his 100th game. Chhetri attacking partner Jeje then came to the party scoring from close range in the 71st minute to double India’s lead as India looked in control while Kenya’s resistance and grip from the game slowly loosened. As India dominated the proceedings, it was the mercurial skipper once again showed his class as the Indian legend finished off his solo run into the box with an exquisite chip over the advancing goalkeeper to score his 61st goal in his 100th game to lead India to yet another convincing 3-0 win. With a convincing 5-0 win over Chinese Taipei and a 3-0 win over Kenya, India has not been tested tactically by a dominant side mostly due to the fact that all the three visiting teams i.e Taipei, Kenya and New Zealand is travelling with a young team and not their first team. India’s plan to use the platform of the Hero Intercontinental Cup 2018 as a springboard for build up to AFC Asian Cup 2019 may not have achieved its mission as any of the three participating teams is likely to test India defensively or attacking the way Stephen Constantine would have liked in preparation for facing quality opponents like hosts UAE, Bahrain and Thailand. The attacking combination of Sunil Chhetri, Jeje Lalpekhua and Udanta Singh have been superlative as they stretched the opponents from the flanks and down the middle. Sunil Chhetri, in particular, has been in the form of his life with his masterful displays inside the box and his telepathic positional understanding with Jeje and Udanta. The emergence of Anirudh Thapa and Pronoy Halder in the midfield has been superlative for India adding skill and steel in the midfield. While Anirudh Thapa has shown exceptional work-rate running box-to-box along with his excellent vision and passing range, Pronoy has been the perfect defensive midfielder India has been looking for. Pronoy has been formidable with his interceptions, tackles and shielding while displaying his eye for goal with the superb long-range strike against Chinese Taipei. Sandesh Jhingan and Anas has been solid at the back keeping clean sheets in two games so far. They have a growing understanding among themselves and can prove to be a solid centre back duo in coming days. Pritam Kotal and Subhasish Bose has added solidity and width to the Indian attack while dropping down while defending or overlapping going forward to provide crucial cross to feed the forward line. Holicharan Narazary the unsung hero, has been doing his job quietly while the stars steal the show. The Assam born wing technician has been tactically important in India’s success as he keeps the momentum going forward down the left flank and showed exceptional stamina dropping deep at times to help out the defence blocking the gaps in the wings that opponents could exploit.